Danny Brown has expressed an interest in teaching mathematics that is relevant to students, relevant in important, sociological ways especially. This puts him in a particular bind with mathematics like Thales’ Theorem, which seems neither important nor relevant. Here is Thales’ theorem. Every student in the UK must learn this theorem as part of the Maths GCSE. You are explaining Thales’ theorem, when one of the students in your class asks, “When will we ever need this in real life?” How might you respond? He proceeds to offer several possible responses and then, with admirable empathy for teenagers, rebut them. 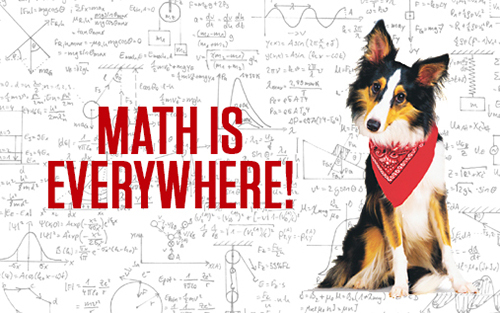 Brown finds none of our best posters for math particularly compelling. You know the ones. Math develops problem solving skills. So instead of fixing our posters, let’s fix the product itself. Among other purposes, every proof is the answer to a question. Every proof is the rejection of doubt. It isn’t clear to me that Brown has developed the question or planted the doubt such that the answer and the explanation seem necessary to students. So instead of starting with the explanation of an answer, let’s develop the question instead. Let’s ask students to create three right triangles, each with the same hypotenuse. Thales knows what our students might not: that a circle will pass through all of those vertices. Let’s ask them to predict what they think it will look like when we lay all of our triangles on top of each other. Let’s reveal what several hundred people’s triangles look like and ask students to wonder about them. My hypothesis is that we’ll have provoked students to wonder more here than if we simply ask students to listen to our explanation of why it works. To test that hypothesis, I ran an experiment that uses Twitter and the Desmos Activity Builder and is pretty shot through with methodological flaws, but which is suggestive nonetheless, and which is also way more than you oughtta expect from a quickie blog post. I asked teachers to send their students to a link. That link randomly sends students to one of two activities. In the control activity, students click slide by slide through an explanation of Thales’ theorem. In the experimental activity, students create and predict like I’ve described above. At the end of both treatments, I asked students “What questions do you have?” and I coded the resulting questions for any relevance to mathematics. This suggests that interest in Thales’ theorem doesn’t depend strictly on its social relevance. (Both treatments lack social relevance.) Here we find that interest depends on what students do with that theorem, and in the experimental condition they had more interesting options than simply listening to us explain it. So let’s invite students to stand in Thales’ shoes, however briefly, and experience similar questions that led Thales to sit down and wonder “why.” In doing so, we honor our students as sensemakers and we honor math as a discipline with a history and a purpose. BTW. For another example of this pedagogical approach to proof, check out Sam Shah’s “blermions” lesson. BTW. Okay, study limitations. (1) I have no idea who my participants are. Some are probably teachers. Luckily they were randomized between treatments. (2) I realize I’m testing the converse of Thales’ theorem and not Thales’ theorem itself. I figured that seeing a circle emerge from right triangles would be a bit more fascinating than seeing right triangles emerge from a circle. You can imagine a parallel study, though. (3) I tried to write the explanation of Thales’ theorem in conversational prose. If I wrote it as it appears in many textbooks, I’m not sure anybody would have completed the control condition. Some will still say that interest would improve enormously with the addition of call and response questions throughout, asking students to repeat steps in the proof, etc. Okay. Maybe. Danny Brown responds in the comments. As to the previous commenter, Thales’ theorem is not a particularly important piece of content in and of itself, but it’s one of my favorite proofs for students to build. It requires careful attention to definitions and previously-learned theorems as well as a bit of creativity. (Drawing that auxiliary line.) Personally, my favorite part of the proof is that students don’t solve for a or b, and in fact have no knowledge of what a and b are. but they prove that a+b=90. The proof is a different flavor than they are used to. Ask the students to draw a rectangle, then the diagonals, and finally a circle around the intersection of the diagonal. There, you have the Thales theorem! The most natural thing of the world. I agree that this is more engaging. I try to do this when I can with my students. (When I can = when I the teacher can think of how to have kids explore an idea to develop the cognitive need for the idea.). I’ve taught HS now for 13 years, everything from Pre Algebra to Pre Calculus, some subjects longer than others. I’ve taught Pre Calculus the longest, this being my 10th year. Each year I taught pre calculus, I’ve had new “aha!” Moments of how I can help students develop a better conceptual understanding and feel the need for an idea. My problem is, that after 10 years, I still can’t figure out how to do that every time. And what to do with my 2nd prep, which I haven’t taught as long, so I’m even less there? This week I sat through a training for a book our district is adopting that presented all their technology pieces, which now include video explanations from a “teacher” teaching like your control group. What I’d love is a resource for teachers that broke down the different theorems and formulas and definitions into explorations for our students to set them up for the need for the theorem or formula or definition. Because I know some people might be embarrassed to admit this, but I’m going to put this out there… I got my subject matter via a test, I am one class shy of a math minor. I don’t know how to do this for every theorem, formula, and definition. But I try. To learn and understand and grow so my students can have a better experience than I had in school. I know we have #mtbos, and people post about this very thing, but it’s such a broad resource and difficult to find specific things sometimes. Maybe a resource like Open-Middle website, organized by subject and broken down by topics, that teachers could then submit their own pre explorations for students. I’ve just been wishing for that very thing. I love the idea of “creating the headache” and letting kids notice and wonder, but I’m a novice at working backwards from my standards to develop these learning opportunities. Since I was taught in the traditional way, this is just outside my experience. Has anyone started a catalog of these ideas? Surely there are many of us who are at different spots on this learning curve and we can help each other. When a students asks, “when am I ever going to use this in the real world?,” they’re really asking something much more foundational about the given lesson and it revolves around engagement. The one piece that still seems missing to me is that you want to go from “ooh” to “why?” So after going through the experimental phase you need an approach that gets most kids to discover explanations for what’s going on. You’re right. This isn’t intended to be a complete proof experience, just an example of a stronger introduction than explanation. More is necessary. I think one necessary next step is to show students a bunch of those right triangles side-by-side and ask them, “What changes? What doesn’t change?” What are others? Because I know some people might be embarrassed to admit this, but I’m going to put this out there… I got my subject matter via a test, I am one class shy of a math minor. I don’t know how to do this for every theorem, formula, and definition. But I try. Thanks for raising this, Claire. I think you’re right to link up math content knowledge and a pedagogy that tries to exploit the origins of mathematical knowledge. I have a bachelor’s degree in math that I haven’t found terribly helpful in this project. More helpful for me was teaching the same course for six years, and looking at it through this lens of need. But I’m pretty clumsy at this with subjects that I haven’t taught. That’s why I enlist people at my workshops at help me. I don’t think I’ve posted this document on my blog (yet) but it might make for interesting reading. This discussion raises the question for me about engaging students in thinking about mathematics–not thinking about how to solve a problem, but thinking about what constitutes mathematics as a discipline. When I am in classrooms where students consistently ask “when am I ever going to use this?” I am saddened to think that they believe mathematics is a series of factual pieces that are ‘used’ in some problem or that an algorithm can be plopped into a real-world situation. It doesn’t work that way in the real-world–real-world contexts are messy and often ill-defined. I like the situations where they make students pause to consider the nuances of situations and develop the curiosity to wonder about and question mathematics. Sometimes I think we forget that mathematics offers opportunities for students to learn far more than the mathematical content embedded in problems–thinking that is predicated upon curiosity, then determining how to rectify ideas–that for me is truly learning mathematics. The experimental version sets this up (A)…and then stops. The control version sets it up (A)…and then explains the solution (B). I find the Desmos-ified version much more engaging and trust that students will find it more engaging. Still, is it possible that control students asked fewer questions simply because the most likely question _was already answered_? I love this. It is some serious retooling about what we think we’re teaching, though. We have to give up some serious idols (coverage, traditional assessment, …), but what we get is so much more engaging, more purposeful for students and more accessible to a diverse class. a variation using that as prompt with a less formal proof. Can you provide the responses to the question “What would it look like if we laid all of our triangles on top of each other”? These responses would be a better measure of the engagement level. Interestingly, a few treatment group participants asked whether the triangles were right triangles. Also interesting is that the control questions were, arguably, more sophisticated. Not using that as evidence for one approach or the other – just interesting. Are the question and the reveal too cluttered? I have difficulty seeing order out of the chaos of three overlapping triangles. The control version is still too formal for my taste. In fact, one question was “what is an auxiliary line”. Proving something is true often does not show why it is true. We have all had the misfortune of slogging through a proof, struggling to check that the next line follows from the previous, but not having any intuitive sense of why the darn thing is true. Does the control approach elicit a need for proof or a need for a reason “why does it make a circle”? I think the latter, and I am not sure how to address that in this instance. On reading these posts, you may see that my preferred pedagogy around proof is not (necessarily) explaining. That said, I don’t think there is anything ‘wrong’ with explicit teaching of deductive proof(s), and I must admit I am not entirely sure how one would make students aware of deductive proofs without explaining or showing them one in some way. What you present here is of course not a deductive proof, rather a prelude to one, an example of abductive reasoning that *may* be considered (by, say, Balacheff) to actually be an obstruction to learning about deductive proof. What are your thoughts on this? Suppose you wanted students to learn about deductive proof, and the proof of this theorem in particular… how would you then proceed from this abductive approach? How would your students become aware of a proof of this theorem that was recognised as a valid mathematical proof by the mathematical community (if we can agree that such a thing exists)? Rene: that’s lovely. I usually prove Thales Theorem in my class the geometric way, because the top ones need to see proofs done properly, but I shall use your idea from now on to show those that can’t follow that it has to be true. What I’d love is a resource for teachers that broke down the different theorems and formulas and definitions into explorations for our students to set them up for the need for the theorem or formula or definition. You’re talking hundreds of theorems and formulas here. What you are asking for is a life’s work. Many of the most important are beyond our students anyway (e.g. finding the value of pi). Most decent texts give one or two simple ones, because that’s all we have time for in our courses anyway. Such explorations are useful but they are, if you are going to do them properly, slow. Also, your students won’t thank you for it, unless they are wildly different from mine. “When will I use this?” is a problem we face. But we also face “Do I need this for my SATs?”. We need to try and balance those things, and long deviations into the wilds of proofs doesn’t do that. Here is a “meta” approach to trying to do this sort of lesson. First, distill the idea into “if [A] then [B]” format or “Steps 1,2,3” format. If you have a semicircle, then the inscribed angle is 90 degrees. Then you can play around with the idea, like Dan said with Thales Theorem, go for the converse (or the contrapositive). Maybe that’s better to explore. Or, if it is “Steps 1,2,3” Bury the important middle step(s), see if the kids can dig ’em up. Or you can play Jeopardy! The answer is “90 degrees” and the kids give the questions. Combining disparate ideas is fertile ground for inquiry: Can you find a way to do transformations with compass & ruler constructions? Is there a geometry task you normally do without coordinates? Try it with coordinates and see if you can find a pattern. It takes time to incorporate inquiry into your class, but with patience, you can do it. Remember that good math theorems can take years to prove, and so can crafting good lessons/units. Also, there’s some good stuff available from Judah Schwartz. 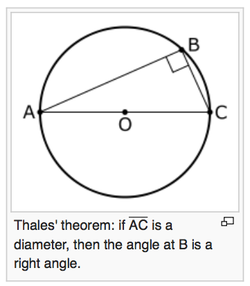 The question that was raised for me about the teaching of Thales’ Theorem is why do the students have to know Thales’ Theorem? Is it because this particular bit of content is incredibly important or is it because it is “indicative” of some aspect of mathematics (or some mixture of these)? I agree with Barb in thinking that the learning of content should be embedded in the larger goal of learning about the discipline of mathematics. Trying to ignite curiosity and wonder in the students is surely one step, among many, that would be necessary in that direction. I like this approach a lot. This is an effective pedagogical approach, but, as designed, it does take a little bit away from the “wow” moment. I worry that students seeing the circle won’t think about the fact that it was that the right angles guaranteed the circle, but just that drawing a few random triangles guarantees a circle. If, instead, the prompt started with “Drag Points A,B, and C to create three different triangles where the segment below is the longest side,” students would start by getting a random mess of points (nothing interesting here). A follow-up prompt asking students to then “Drag Points A,B, and C to create three different right triangles where the segment below is the hypotenuse,” students would see that it is the right triangles that make the points form a circle. I worry that if we go too far down the “cool teacher magic trick” road in Geometry, kids start to see it as just a cool picture that makes them do a proof afterwards. As to the previous commenter, Thales’ thm is not a particularly important piece of content in and of itself, but it’s one of my favorite proofs for students to build. It requires careful attention to definitions and previously-learned theorems as well as a bit of creativity (drawing that auxiliary line). Personally, my favorite part of the proof is that students don’t solve for a or b, and in fact have no knowledge of what a and b are, but they prove that a+b=90…different flavor than they are used to. Thanks for the response, Danny. I don’t disapprove of explanation in general. As lots of researchers have pointed out (the van Hieles come fastest to mind; Harel & Sowder also) deductive reasoning is weird and hard to learn. Bringing new learners into the community of mathematicians and helping them understand what constitutes a valid proof is also difficult work. I don’t dismiss the role of explanation or direct teacher modeling in helping students with that work. But I don’t think explanation is an effective or interesting introduction to that work. This post asks “how should we motivate proof?” How do we help students understand why mathematicians think a proof is necessary? Suppose you wanted students to learn about deductive proof, and the proof of this theorem in particular… how would you then proceed from this abductive approach? My next move here is to feign surprise at the slowly forming circle and ask students to please create a right triangle that doesn’t lie on the circle. I appreciate this distinction. The math is less important here than the mathematical practices it lets us glimpse.